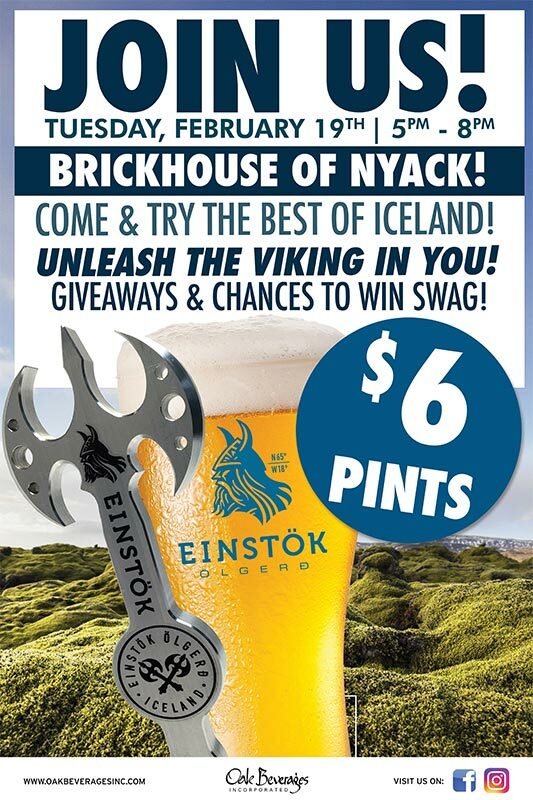 Brickhouse Einstok Pint Night - Oak Beverages Inc.
Brickhouse Einstok Pint Night, Tuesday, February 19th, 5pm – 8pm. Come and try the best of Iceland and unleash the Viking in you! $6 Pints, Giveaways, and chances to win Einstok SWAG! Brickhouse Einstok Pint Night, Tuesday, February 19th, 5pm – 8pm. Opened in the fall of 2014, Brickhouse is located in the historic village of Nyack. Since its inception, Chef Paul Brown has been serving both authentic BBQ and wood fired brick oven pizza, while making daring new ventures into the uncharted territories of food.